Register your school for Red White and Blue Day and get exclusive lesson plans, competitions and downloads for your class. Red, White & Blue Day is run jointly by ABF The Soldiers’ Charity, The Royal Navy and Royal Marines Charity and The RAF Benevolent Fund. These three national charities are responsible for the welfare of soldiers, sailors and airmen and their families. 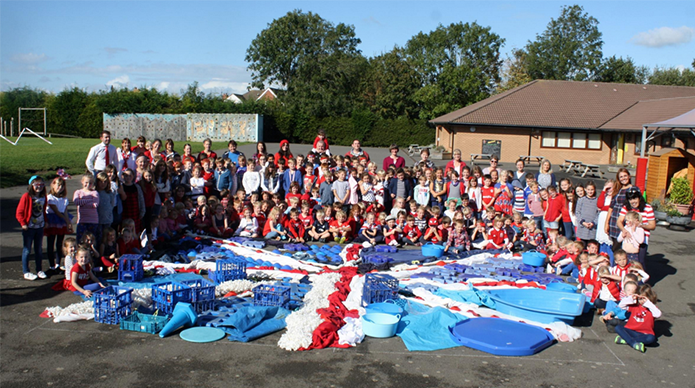 The first ever Red, White & Blue Day was held in October 2011, with 54,000 children from 175 schools taking part. The event was part of the wider Ten for Ten project, organised by Alix Hodge which marked ten years of British Forces involvement in Afghanistan. Alix’s husband Marcus, who is an artist, was commissioned by 3 Rifles to go to Sangin in Afghanistan. Alix was so moved by the events Marcus captured that she wanted to mark the efforts of those who had served in Afghanistan. ABF The Soldiers’ Charity worked with Alix to run Ten for Ten and as a result were approached to project manage Red White & Blue Day. Today Red, White & Blue Day has grown in size and is open to every school within the British Isles as well as military schools based overseas. Pupils simply donate £1 and dress up in Red, White and Blue, holding cake sales, sponsored events, or their own weird and wonderful fundraising ideas! The money raised is split between the three service charities. If you would like your school to get involved in Red, White & Blue Day, simply visit www.redwhiteblueday.co.uk or click below to register now. Register for Red White & Blue Day!